What Does A Compressor Pedal Do For Your Guitar? Choosing the right pedals for your pedalboard can be a challenge. The sheer number of guitar pedals can make the task somewhat daunting. 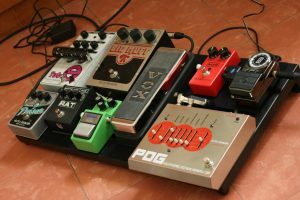 One guitar pedal that often gets overlooked when a guitarist sets up his or her pedalboard is the compressor pedal, and that’s what we’re going to take a look at today. Compression is a subtle effect, especially when compared to a distortion, delay, or a phase shifter—which is often why it gets overlooked, especially by beginner or intermediate guitarists. Nevertheless, a compressor pedal, when used properly, can shape and enhance your guitar tone in some rather significant ways. Today, we’re going to look into what a compressor pedal can do for your guitar. Compressor pedals are typically used to enhance the sound of a clean guitar for a couple of reasons. First, notes played with a clean guitar tone often lack sustain and begin to decay quickly after the string is plucked. Compression extends the life of the note by raising the volume as it decays. Secondly, compression works very well with the fingerstyle or hybrid picking (guitar pick and fingers) used by country guitarists. It is difficult to achieve a balanced sound playing fingerstyle electric guitar—particularly rhythm guitar—because strings played with different fingers can easily have subtle differences in dynamics and volume. A compressor pedal solves the problem by leveling out the dynamics of the different strings. Country guitarists often use a compressor pedal with a slapback delay pedal to achieve a distinctive, thick sound, while blues guitar players will sometimes use a compressor with a light overdrive pedal to fatten their tone even further. Basically, no matter what kind of music you’re playing, odds are you can benefit from a compressor. Standard pedalboard with a two-knob MXR Dyna Comp compressor (the red pedal). Most all compressor pedals have a “sustain” control and a “level” control. Sustain controls the amount of compression that you want while the level control allows you to dial in the overall volume of the effect. Depending on your exact compressor, it may have attack and tone controls as well (or if it’s setup more similar to a studio compressor it may have Ratio, Threshold, Attack & Release functions). The attack function allows you to control how quickly the compression kicks in and the tone control allows you to dial in how bright or warm you want it to sound, much like the tone knob on your guitar. Dialing in the tone makes it possible to compensate for some of the tonal effects of compressing the peaks of your signal (which typically results in more bass than in your unaffected signal). Learning to use a compressor pedal takes a little bit of trial and error, but a good place start is setting the controls at 12 o’clock. Practice playing chords and single note lines with the pedal bypassed, then turn the pedal on and play the same thing again and listen for the difference. In most situations, you won’t want to actually dime your sustain knob because you’ll end up squashing your dynamics and squeezing the life out of your playing. Compressor pedals are best used subtly, so in most cases, you’ll end up keeping the sustain knob between 11 and 2 o’clock and adjusting the level to unity with your unaffected signal. Compression is a particularly helpful tool for bass players in the studio and on the stage. It helps to make the bass guitar more defined and articulate while also helping reign in the wide dynamic range of the bass. Compression will make short notes more punchy and articulate while giving more sustain to the longer notes. You’ll want to follow the same “less is more” mindset when using a compressor on a bass, as subtlety is the name of the game here. We figured it would be best to give you all a few examples of what a compressor does and how it sounds, so check out the video below to hear one in action.